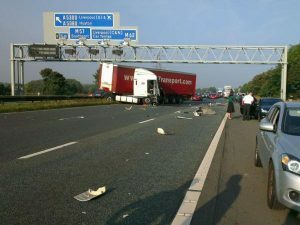 A lorry collided with other vehicles before before ending up jack-knifed on the central reservation on the M62. The accident happened on Wednesday 17th September on the eastbound carriageway between J6, Knowsley Expressway, and J7, St Helens Linkway at 8.44am. It is understood that a woman was been taken to Aintree Hospital with neck and head injuries by the North West Ambulance Service and fire crews had to cut a man free from a vehicle. The motorway was closed and traffic diverted onto the Knowlsey Expressway, and the A562 towards Widnes. We wish those involved a speedy recovery. Should you find yourself injured in an accident that was not your fault then our qualified experts are available for advice and a free consultation. This article was added on Wednesday, September 17th, 2014 at 3:37 pm and is categorised under General News, Traffic Accidents. Both comments and pings are currently closed. Error: Error validating access token: Session has expired on Saturday, 09-Mar-19 13:12:58 PST. The current time is Wednesday, 24-Apr-19 19:59:57 PDT.